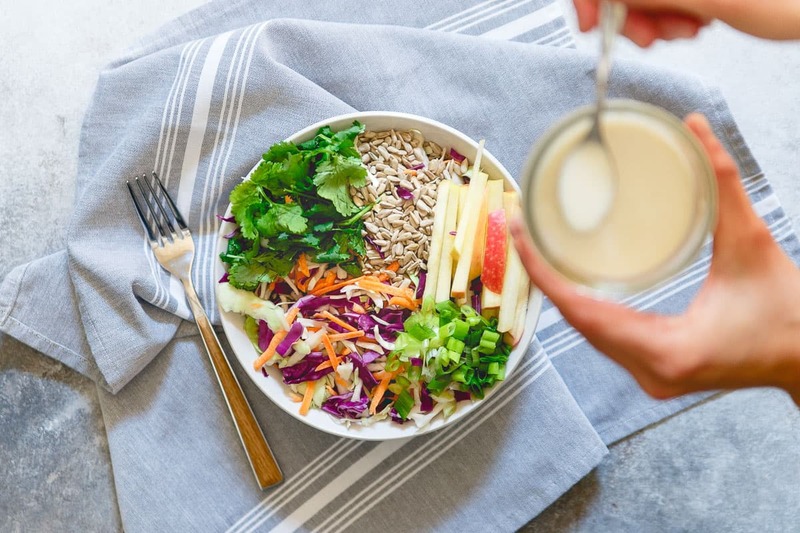 This kefir honey mustard dressing is creamy, tangy and boosted with both naturally occurring probiotics and a probiotic powder supplement to up your healthy salad game! Over the past couple of weeks we’ve discussed both what to eat around training and tips for hydration, focusing more specifically on how both of these things affect athletes of all types. While regular exercise supports digestive health in certain ways, this week, for the last post in collaboration with Herbalife Nutrition, we’re diving into immunity and gut-health in particular, and going a bit deeper than just exercise. Our digestive system does a lot for us every day, yet many of us ignore it until problems arise. It breaks down all the foods we eat in order to make nutrients and energy available for our bodies, it’s responsible for getting rid of unwanted waste and it’s a key player in our immunity – something I think few people actually realize. The cells that line our digestive tract usually don’t let many harmful bacteria and viruses through that could potentially make us sick. Knowing that, don’t you want to do your best to keep it happy and healthy? Good news – we’re going to talk about one of the ways to do just that: probiotics. Our intestines are lined with tiny little hairs (called villi if you want to be technical). Their purpose – to capture nutrients and send them into our bloodstream. These villi are lined with good bacteria called probiotics. Probiotics repel yeast, bad bacteria and fungi from getting into the bloodstream and assist in allowing the nutrients to be absorbed. So, probiotics are something that naturally occur in our bodies. The problem is some medicines (antibiotics) and diets high in processed foods can cause these helpful bacteria to die off leaving our digestive tract compromised in its efforts to keep our immunity strong. 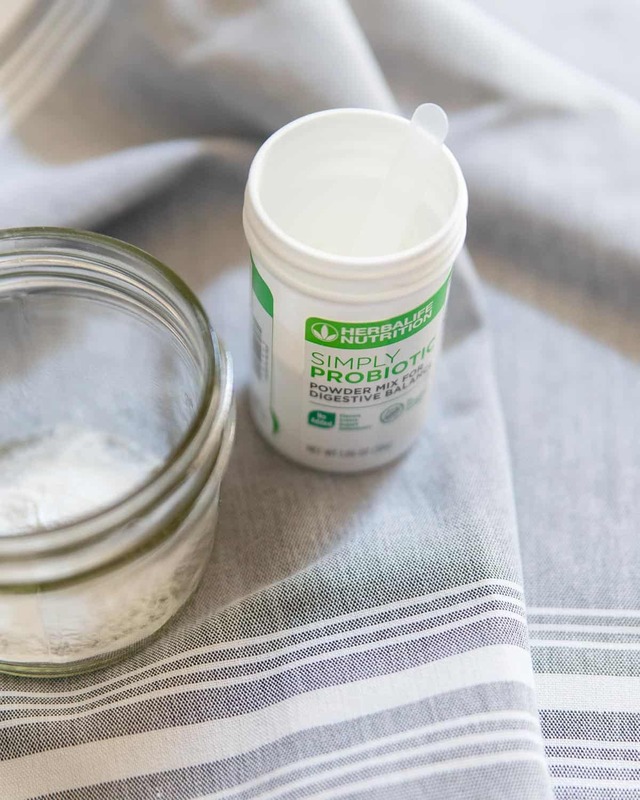 The good news is that probiotics can be introduced to the body both through certain foods that already contain these beneficial bacteria and from supplemental products, like Herbalife Nutrition’s Simply Probiotic. We’ll explore these methods a little more deeply below. Before getting into how to get more probiotics into your diet, let’s cover the difference between PRObiotics and PREbiotics as you’ve probably heard of both. We’ve already discussed how probiotics are the good bacteria that live in your gut and help your body absorb nutrients from food. Prebiotics, however, are compounds found in many high fiber foods that help our bodies break down fiber. They basically aid in “feeding” the good bacteria, probiotics. Foods with a high prebiotic content are bananas, onions, garlic, asparagus, tomatoes, apples, nuts, and whole-wheat foods. I’m a big fan of getting as much as I possibly can from real food before turning to supplements. In fact, that’s one of the main missions of this site – encouraging the consumption of real, wholesome foods for fit-minded people through recipes that celebrate their deliciousness. I’m betting you’ve heard of yogurt when it comes to probiotic-rich foods and while that is an excellent choice (look for one that says “live active cultures” on the label <– that’s the probiotics! ), there are many other choices out there too. -fermented foods like pickles, kimchi, sauerkraut, etc. While you can buy fermented foods in the grocery store, you can also make your own at home very easily. Check out this post I wrote a couple years back on How to Ferment Vegetables if you want to experiment on your own. While yogurt or kefir are daily occurrences in my diet, I also love keeping a jar of kimchi on hand to easily add to meals. This kimchi potato hash and this bulgogi kimchi rice plate are great examples of how to get a healthy digestive boost to a normal meal. I personally double up on my probiotic intake both from real foods as much as I can and through a daily supplemental product. Probiotic balance, or imbalance rather, can be one of the causes of yeast infections and UTIs and if you’ve ever experienced either – you’d likely do anything in your power to keep it from happening again. Therefore, as a woman, I take my probiotics seriously! As with many things, you want to do your research on a good supplemental product before purchasing. There are lots out there when it comes to probiotics and certain strains of bacteria are believed to help target specific issues so choose the best one for you. I’ve recently started incorporating Herbalife Nutrition’s Simply Probiotic into my daily routine and what I love about this one is not only the high active culture count (there are 1 billion per serving! ), but it’s formulated with a powerful strain designed specifically to help survive the gastric journey and get where it needs to be to do its job in your gut. It’s easily carried with you, as it doesn’t require refrigeration like a lot of probiotic supplements and it mixes easily into your food or drink. My go-to is stirring it into my coffee in the morning but I also like experimenting with it in other ways like this creamy kefir honey mustard dressing. 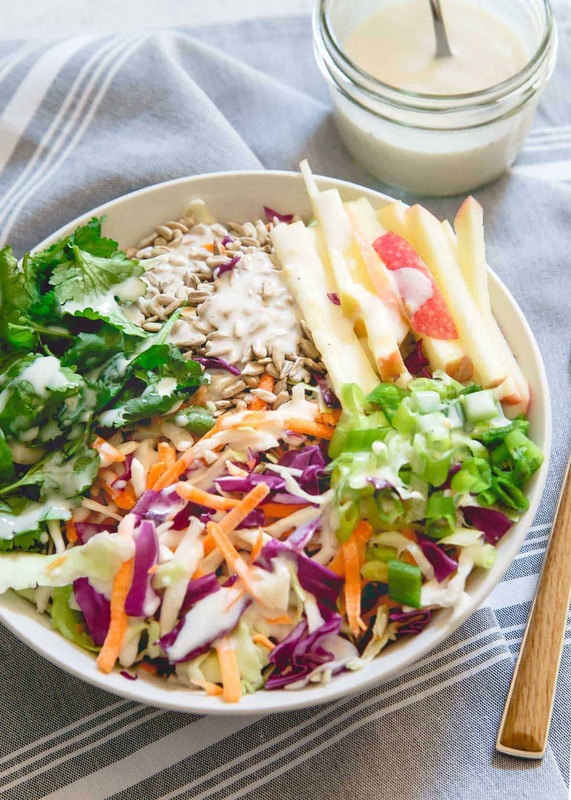 If you were munching away on a salad drizzled with this dressing, you’d likely have no idea it’s anything but a yogurt version of the always delicious honey mustard option. 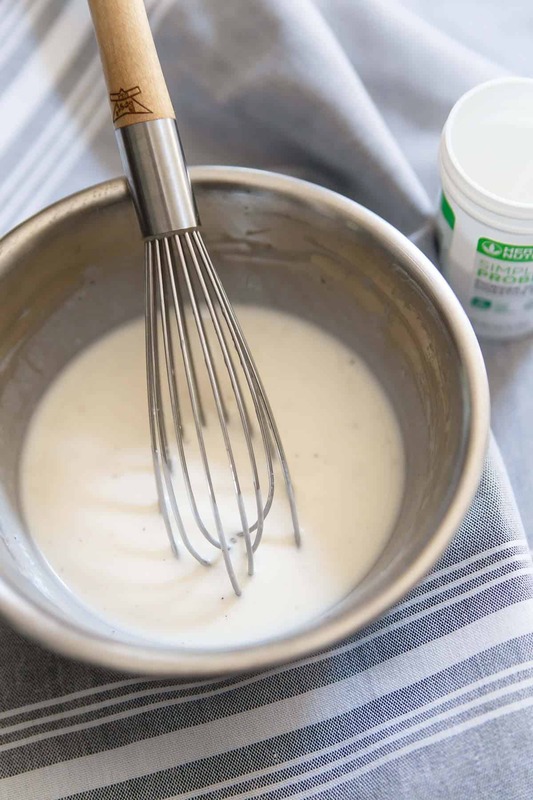 But, this kefir honey mustard dressing is packed with a double punch of gut-healthy probiotics both from the kefir itself and the Simply Probiotic powder whisked in. It takes just a minute to make and is such a great healthy, flavor-packed, homemade dressing option it will really make you think twice about grabbing a bottle from the store next time. Love this creamy kefir honey mustard dressing recipe? Try other homemade dressings: Creamy 3 herb dressing and Garlic Herb Tahini Dressing. Keep refrigerated in an air-tight container. This is such a clever way to add probiotics to your diet without having to really think about it! I think the challenge for me when I first started was always forgetting to take my supplement — this is perfect for someone like me! What a delicious dressing idea. I really need to add more prebiotics to my diet – I have focused on pro, but didn’t realize how important they both are! I’m always looking for ways to get in some extra probiotics! I need to do better about including foods with probiotics in my diet. Thanks for the tips!